David Carlstedt is doing his PhD in the group Composite Mechanics. 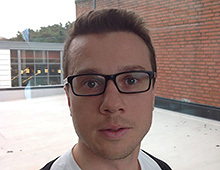 As PhD in the Material and Computational Mechanics department, he focuses his research on computational modelling of structural battery composites. The goal is to create multifunctional composites that can store chemical energy (i.e. work as a battery) while simultaneously provide high mechanical integrity in a structural system. The research area is particularly important for the aeronautic and automotive industry. Structural battery composites have the potential to revolutionize future design of lightweight electric vehicles. There might be more projects where David Carlstedt participates, but you have to be logged in as a Chalmers employee to see them.